The Indiana Convention Centre is an incredible place to make new connections and secure new business. Located in the trendy Mile Square area, you'll be walking distance to Lucas Oil Stadium where the Colts play. Across the White River is the Indianopolis Zoo and a bit further the Indianapolis Motor Speedway – the home of the legendary Indianapolis 500! We'll have your business off to the races with our superior selection of trade show displays and exhibiting solutions to help you gain the pole position ahead of the competition. 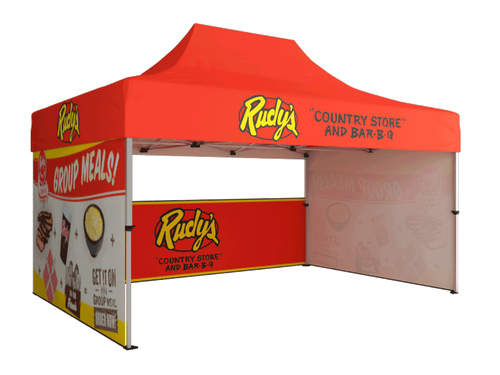 By taking the time to enhance your branding with a portable exhibit, portable trade show display, pop up display, retractable banner stand, and even a 10x10 trade show booth, you can convert more leads to sales. Where is the Indianapolis Convention Center Located? The Indiana Convention Center is located at 100 S Capitol Ave, Indianapolis, IN 46225. Located right downtown, it is home to a wide array of lucrative trade shows in the region. It’s important to establish the goals you want to achieve by having a trade show booth. Do you want to expand your list of leads? Are you looking to meet people? Do you want to close sales? The type of trade show booth you choose will be highly dependent on the goal you have as well as the products or services you are trying to market. You want to achieve a high ROI. As such, you want to look at the type of booth you get as well as the design so you can maximize your presence at the trade show. You can get a better response from prospective customers by making sure that your booth looks great and is informative. In order to promote your booth, you need to make sure to market it, even before the trade show starts. Establish a campaign weeks prior to the show itself using industry magazines, social media, and your established newsletter. By creating plenty of momentum and anticipation, existing and prospective customers alike will visit your booth. When you take the time to create a great-looking tradeshow booth, you will be able to accommodate all of these types of customers. Emphasize the unique benefits that your brand has to offer. Rather than telling prospective customers who you are and what you have to offer, which are important, let them know why they should choose you instead of the competition. When you take the time to create a great-looking tradeshow booth with eye-catching graphics and a lot of information, it will help you to achieve a higher return on investment by getting prospective customers to stop and interact with you.